First, you'll follow mysterious tracks through the city on 1-mile chase through city streets and gardens. You can chase alone, with friends, or join a team when you arrive. (If you're doing a night chase, bring a flashlight.) Be prepared to duck under rails, swing around poles, leap up steps, run along low ledges, and slalom through urban obstacles. Successfully finish the chase, and you'll discover our secret-meetup spot. Together, we'll see if we can lure a few more species out. Design your own 1-block team chases... and earn achievement badges for each species you chase. Can you collect all 13? It's very possible that we'll actually encounter 1 or 2 real, giant cryptids in the wild. So be prepared to interact with creatures unlike any you've seen before... we'll take your photograph with them if you don't startle them off! Come alone, or bring adventurous friends! Wear sneakers and clothing you can run around in. Bring a bottle of water. You WILL get thirsty. DON'T bring too much gear -- you'll be running, and there's nowhere to safely stash your stuff. You DON'T have to be fast, athletic or coordinated to chase the cryptids. You do have to be adventurous, and willing to sweat. Consider yourself warned: There are no on-lookers at a cryptid chase... only adventurers. 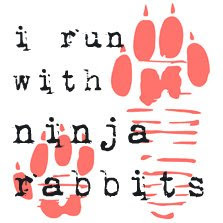 as a ninja bunny, I have to say I love your idea! this sounds like such fun, I hope I can make it! Glad to see you're putting your parkour training to use in trying to get America moving. Best of luck from all the traceurs in Wellington. LOL. Love the ninja bunny hats idea. It's really cool to see someone putting public space to good use! I have a couple of ninja costumes and it's so hard to find a good time and place to use them! lol I got 'em from KarateMart.com in the ninja costumes section.